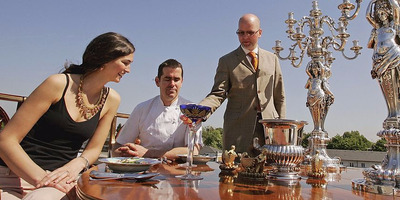 The average salary it takes to be rich in one place can be different from other places. 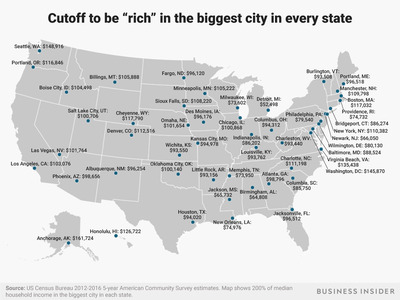 Business Insider used data from the Census Bureau to estimate how much a household would need to make to fall above twice the local median income in the biggest city in every US state. A salary at the top in one part of the US may put you in the middle class somewhere else. There are no official definitions of what it means to be rich, and many factors come into play for measuring where one falls in the often amorphous class structure of American society. But, we can at least make some approximations. In an analysis of the changing shape of the American middle class, Pew Research Center divided the population into three groups: Lower-income Americans made less than 2/3 of the median household income, middle-income households had incomes between 2/3 and 200% of the median, and upper-income households had income more than twice the median income. Household income includes all sources of money for an entire household, reflecting that many households have non-working members or sources of income rather than earned salaries. Medians are often more useful than averages for looking at the distribution of incomes in a group, since averages can be skewed by extremely high-value outliers. We looked at the cutoff for households making twice the local median household income, and thus falling into the upper income bracket following Pew’s classification, in the largest place in each state, based on the US Census Bureau’s 2012-2016 American Community Survey 5-year estimates.